If no one was looking, I really think I could eat this whole chicken pot pie myself… in one sitting. I love comfort foods so much and when it’s healthy and this good, then stand back and give me a big fork! 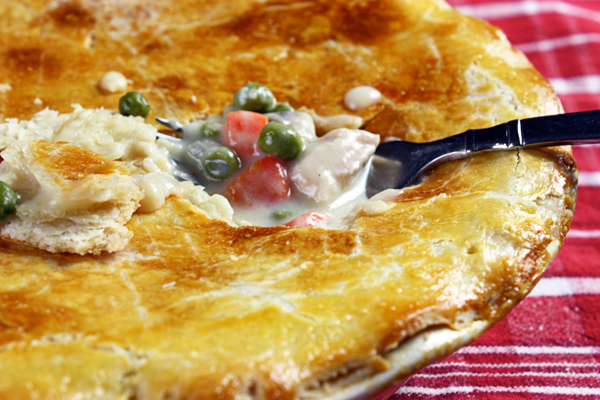 Chicken pot pie is an American classic and homemade is the only way to go. This recipe makes it so easy to have one of the best comfort foods you’ll ever have. Most pot pies are made with butter and cream in the filling plus butter or shortening in the crust and don’t even get me started on puff pastry – just look at the ingredients! My recipe has no cream and no butter anywhere. The filling is rich and creamy and the crust is light and flaky (it’s made with olive oil). The whole thing takes an hour to make, start-to-finish, and that includes prep. Well… except you have to let it sit for 15 minutes before serving – just enough time to make a salad. 5 Comments on "How To Make Chicken Pot Pie"
I would like to bake mini chicken pot pies with this recipe in a muffin tin. I want to give it as a gift – is there a way I can keep it raw and refrigerate or freeze overnight so she can bake it fresh? I wish I could help but this is out of my range of experience. Maybe someone who sees this can help out or else look around online for some info. This is the best and easiest recipe there is to follow. I love the idea that I can use this pie crust recipe on any pie I want. I made twice the dough and based the shell as well. My family loved it so much they had me make it two days in a row. 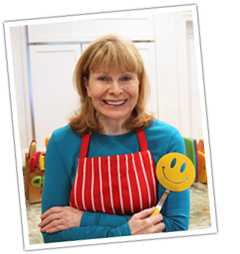 I was so very pleased that I went with your recipe, thanks for sharing. BTW, next…I want to make the apple muffins!!! Look amazing too!!! Wow! Jenny that looks so so very good!!! One of our favorites and I always make it homemade. Looking forward to making it this way next time.